First New Mt. Scopus Delivery Room Since 1976: Hanukkah Miracle #5. 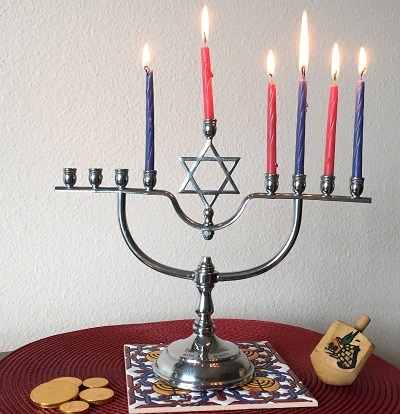 Tonight, the night of the fifth Hanukkah candle, will be the first time since Hanukkah began that Elisheva Levine will get home to her family for candle lighting. “I can’t complain,” she says, “because an event like this happens once in 40 years.” Mrs. Levine is the head nurse midwife at Hadassah Hospital Mount Scopus, and this Monday, the first new delivery room complex was dedicated since Hadassah Mount Scopus itself was re-opened in 1976. The complex was ready on time for the festive dedication on Hanukkah. The beautiful ten-bed center has huge labor and delivery rooms, with stylish bathrooms–some with whirlpool baths–and lots of space for family members, who accompany the mom in labor. “Because it’s brand new, I wanted to be there for anything that might come up, day or night, and to make sure everything was running smoothly,” said Mrs. Levine. Having immigrated to Israel from Chicago when she was 18, Mrs. Levine has delivered more than 1,000 babies. She heads a team of 40 Jewish and Arab midwives, who literally work day and night bringing babies into the world. On Tuesday, the first day the delivery room was open for business, in walked a pregnant Hadassah nurse–Yezina Berhanu, who works in internal medicine. Born in Ethiopia, she immigrated to Israel when she was 16. She’s been a nurse at Hadassah for five years. When she finished her shift at 11 p.m. on Monday evening, she went home, feeling what she assumed were a few random contractions. She had two children at home–a boy and a girl–so she’d been through labor before. The contractions came and went all night, but by morning, she thought she should go back to the hospital, a ten-minute ride from her home.